If you live in Lamorinda, you have likely heard of Sharon McGinnis-Girdlestone. Ask anyone where to get a special cake, and they will recommend her Lovely Little Cakes. She also delivers sustainable, healthy meals weekly to her My Sustainable Table customers. Sonya Ginsburg works with McGinnis-Girdlestone on these businesses. Working out of her commercial kitchen in Oakland, McGinnis-Girdlestone has had the opportunity to observe homelessness in a tent city a block or so away from her business. She has made a practice of delivering any leftover meals that she has to the people there. But seeing how great the need was, she wanted to do more. This desire and willingness to help led her to create Meals for Change. Her mission is to help end the disparity. McGinnis-Girdlestone started making meals for the homeless in her own time, with her own money. But with her very busy life and three young children, that wasn't ideal. In 2014 she had started a community Facebook page called Lamorinda Families with the goal of bringing the community closer together. "Since this group started," she has written, "I've been in awe of some of the members. Truly wonderful givers, beautiful souls and strong willed, ball-busting do-gooders. A perfect combination!" So she put out a call for volunteer cooks to come and cook meals for the homeless with her in her commercial kitchen once a week. She set up a Signup Genius account for Meals for Change and quickly filled up her needs through the end of April. Then she set up a GoFundMe account to pay for the ingredients, which she purchases from Whole Foods and Sprouts Market. Within two weeks she had raised over $2,400, enough to keep the program going for the next two months. Another local woman, Jaime Askew, decided to try to raise $750 for Meals for Change. She is offering members of Lamorinda Families Facebook group organic soap sets for $15, of which $5 will go to the McGinnis-Girdlestone project. 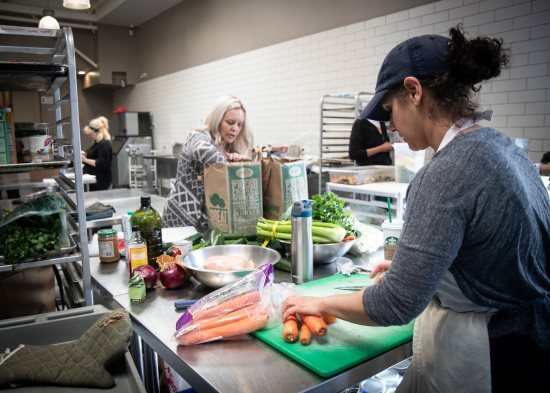 On a recent Monday, two volunteers, Jennifer Dietschy and Lindsay Robinson, friends from Walnut Creek, spent their morning cooking lasagna for Meals for Change. From the time the kitchen opened at 10 a.m. they were busy boiling noodles and preparing the lasagna filling of ground turkey with fresh spinach, ricotta cheese, and a mix of shredded cheeses. The two large pans of lasagna, 40 servings, were delivered to White Pony Express, which brought the dishes to Parkhaven Community Church for its Wednesday night program. White Pony Express was founded by Carol Conner in 2013 when she saw food being thrown into a dumpster, and then, a little later, she saw someone begging for food. It occurred to her that poverty is not about scarcity but rather a problem with distribution. She wanted to create a link between surplus and need. Originally part of Sufism Reoriented, WPE quickly became independent and is not a religiously affiliated organization. 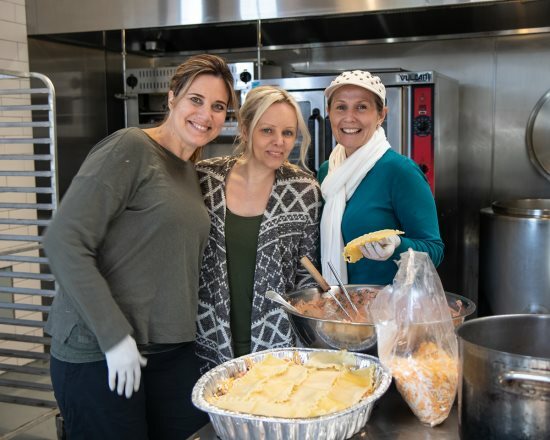 The volunteer 501(c)(3) charitable organization now picks up and distributes food to 70 different agencies through Contra Costa County, where, according to Erica Brooks of WPE, it is estimated that over 10 percent of the population is living below the poverty line. WPE interviewed nonprofits which help the poor that needed food, especially fresh food, but that did not have the means to get it. WPE also contacted retailers who had surplus food to dispose of, but did not have the means to distribute it. WPE became the link to get food from where it wasn't needed to where it was needed. Soon the organization started getting calls from retailers such as Costco, Nob Hill Foods, Starbucks and Whole Foods, wanting to schedule pickup. With funding from foundations, individuals and corporations, WPE was able to buy refrigerated trucks, now used to pick up hundreds of pounds of fresh food daily from retailers and deliver it to nonprofit organizations and schools. Thus far, WPE has rescued and delivered over 8 million pounds of nutritious, fresh food. Seven days a week, 6,500 pounds of food is delivered at no cost through their network of more than 70 nonprofit partners, from large shelters to church pantries. More than 200,000 pounds of perfectly good, edible, nutritious, highly perishable food a month is diverted from landfills by WPE, saving over 200 tons of CO2 gas per month from entering the atmosphere. April is WPE's spring fundraising campaign. According Brooks, when Parkhaven Community Church, one of their partners, needed meals prepared, WPE reached out to McGinnis-Girdlestone, and a win-win project was created. 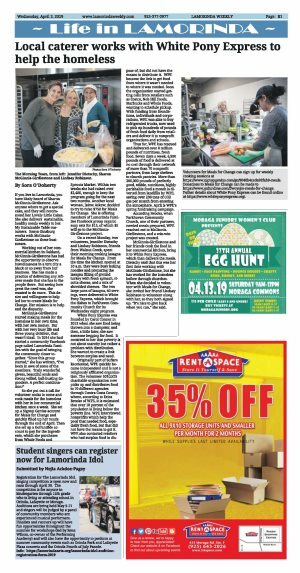 McGinnis-Girdlestone and her friends cook the food in her commercial kitchen, bring it to White Pony Express, which then delivers the meals. Dietschy said that this was her first time working with McGinnis-Girdlestone, but she has worked for the homeless before through churches. When she decided to volunteer with Meals for Change, she invited her friend Lindsay Robinson to volunteer along with her, so they both signed up. "It's nice to give back when you can," she said. Volunteers for Meals for Change can sign up for weekly cooking sessions at https://www.signupgenius.com/go/9040b4cada92fab9-meals. Futher details about White Pony Express can be found online at https://www.whiteponyexpress.org/.